Match each number a specific color, consistently – not a bad idea when making colorful learning materials for early numeracy. 1=brown, 2=red, 3=orange, 4=yellow, 5=green, 6=blue, 7=purple, 8=gray, 9=white. 10 I represent with the color for 0=black, and 12 with red, and 16 with blue. I propose that educators use the Electronic Color Code standard and adapt it as needed. It reflects Nature as in the rainbow/visible electromagnetic spectrum, and is also the internationally accepted convention and standard to represent numbers using colors. In Math as with everything else STEM and education, I am of the opinion that “schooling”, defined here as the intentional process to help a student achieve learning and knowledge, should be as much as possible connected with the Real World. Those of us who do not subscribe to the “because I said so” school of teaching already agree that learning is not necessarily connected with schooling. Thus, for schooling to be have some chance to become valid, relevant, useful to learning, it has to be part of the real world, beyond its pretty red building. “School stuff” if by itself, bad, but when connected to “Life stuff”, can be good. Most illustrators of children books will make some attempt to use color. Understatement. When dealing with numeracy, this is overwhelming and quite random. Random is not actually too bad, IMHO. If it’s going to be done wrong, it better be random that follow a weak or made-up standard. Ar e there standards? well, not quite, but a valiant attempt especially fashionable from the late 60s until the 80s were the Cuisenaire rods and derivatives. The fact that they were protected with copyrights and patents (since then lapsed or lost exclusive right, at least in Canada) might have influenced their lack of adoption by others. 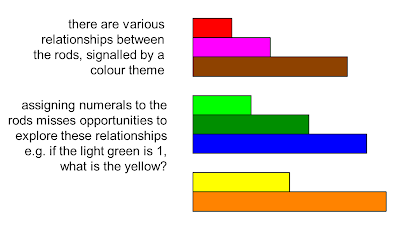 There is an attempt of logic at the Cuisenaire color choices, well portrayed here, but still far far short of the simple logic of the rainbow sequence. I do like some advanced relationship work that can be done, like with 12. Yet, it remains closed into itself in a school-y way, not much Real World. Then there is the Montessori Beads. The chosen color sequence appears to be random and its minor impact in Public Schools has made for even less of a “standard”, except of course among true devotees of said tradition. If you are teaching in a Montessori classroom, I do recommend that you follow this color scheme because your materials to be consistent with the entire Montessori curriculum. If you are making the beads at home, the color choices are completely up to you – just make sure you are always consistent yourself. While admitting that in evidence-based schooling there is no single one-size-fits-all solution, certain principles can help us make less-bad choices. For one thing, do reference Nature in your teaching – if a good organic, biologic-dynamic solution exists, that might be better than a totally artificial alternative. Yet, an established standard or convention that is commonly understood to many people is an important thing to have. Say, a person learning a totally made-up language or script might be cute, that endeavor probably will not help much with employment and other life needs, not as much as learning a language used by many will. When Nature deals with colors as a sequence, there’s the rainbow. As a representation of the visible fragment of the electromagnetic spectrum it is quite connected with notions of quantity – thus its use for numeracy is sort of obvious and a Good Thing. Visible Red corresponds to a smaller frequency than visible Blue. trick question: in Nature, is blue a “cold” color? See the answer later. As to established conventions, the only example that I know of a color sequence reflecting the decimal number order is the Electronic Color Code. I like it that 0 is black – i.e., the absence of color=absence of quantity. Oh, BTW, the conventional order is the geek one for digits: 0 to 9. Thus here on right, where we go 1 to 10, black stands for the later. Of course there is also the Hex RGB code, but even you, dear polymath reader, will agree that trying to use that as a basis for pre-school numeracy is a bit too much. Sincere educators admit that teaching, and especially schooling, demands simplification of concepts, a (hopefully) careful choices that do not alter facts. IMHO that is necessary, which trumps “perfect” any day. Thus there is no goal – during the basics of numeracy – for the whole of multiple-band Electronic Code values. Right now I just focus on the “unit” digit for a count of parts, as on the denominator in fractions. One request: if you are aware of some color sequence used in school materials that makes any sense, please contact me? I am not afraid to be a pioneer with a new idea, but it does worry me some that this matter has not had much attention paid to it – and we are talking Sagan numbers here (“billions and billions”) of school items that are maybe not “wrong”, but certainly not “right”, wasting the opportunity to be Real Life relevant and useful because they use some random color scheme, when they could do better… Maybe there has been another initiative out there that deserves being THE color sequence for numeracy purposes? 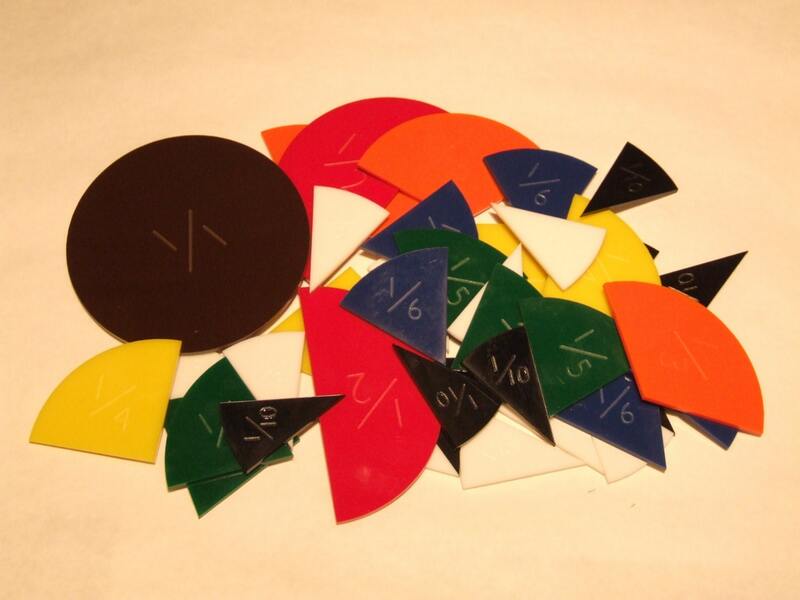 My first product was the Fraction Circles.